A WEEK IN HEAVEN OR HELL? The elegant and historic Gramercy Park Hotel could hardly be referred to as Hell. 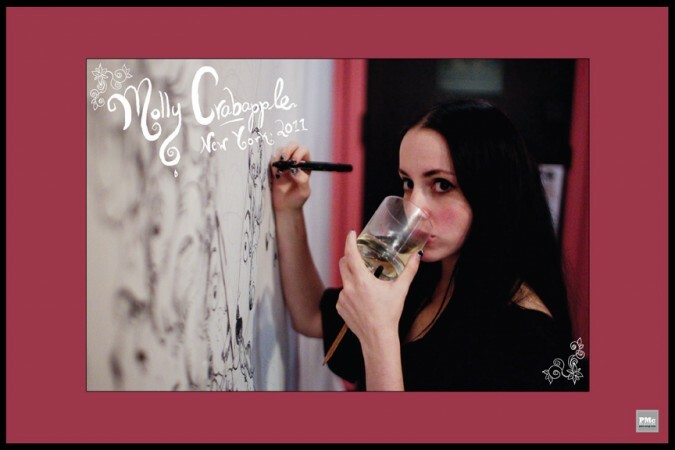 Last fall, the gorgeous and talented Molly Crabapple locked herself in a hotel room at the Gramercy Park Hotel, covered the walls with paper, and drew from floor to ceiling for a week straight. I stopped by one day for a rainy afternoon of absinthe drinking, and to watch her progress. All of this was a Kickstarter experiment, which originally asked for $4,500, and ended up with upwards of $25,000. The drawings that covered the room were pre-sold in this Kickstarter plea, and many were on hand to document the decadent week of her captivity. The results have been documented in a beautiful pictorial book, aptly named Week In Hell. With many photographs by Clayton Cubitt, the book documents the fantastical self-created world in which Molly lives, as well as the cast of characters who came to visit her, many of which were immortalized on the walls with her drawings–including cameos by PMc favorites Stoya and Amber Ray. Week in Hell is a glimpse into the artist’s rich life, and creative process in the stunning setting of the Gramercy Park Hotel. It is now available on Amazon, as well as local book and comic stores.